In their educational attainment levels, Muslims closely resemble the general public. About three-in-ten (31%) U.S. Muslims are college graduates, including 11% who have a postgraduate degree. On average, Muslim immigrants are more highly educated than U.S.-born Muslims. Financially, Muslims are about as likely as Americans in general to have a household income over $100,000. At the same time, they are more likely than Americans in general to have an income under $30,000. The survey also finds that Muslims are three times as likely as other Americans to be without a job and looking for work. The rest of this chapter provides a detailed examination of the demographic characteristics of the U.S. Muslim population. Nearly six-in-ten U.S. Muslims adults (58%) are first-generation Americans, having been born in another country. An additional 18% are second-generation Americans – people who were born in the U.S. and who have at least one parent who was an immigrant. 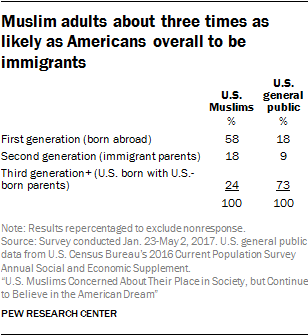 About a quarter (24%) of U.S. Muslims are U.S. natives with U.S.-born parents (i.e., they are from families who have been in the U.S. for three generations or longer), which is the case for nearly three-quarters of U.S. adults overall (73%). Among U.S. Muslim adults who were born abroad, more come from South Asia (35%) than any other region. An additional 23% were born in other parts of the Asia-Pacific region (such as Iran, Indonesia, etc. ); 25% come from the Middle East-North Africa region, 9% come from sub-Saharan Africa, 4% were born in Europe and 4% come from elsewhere in the Americas. No single country accounts for more than 15% of adult Muslim immigrants to the United States (15% are from Pakistan).8 The countries with the next-highest totals are Iran (11% of Muslim immigrants), India (7%), Afghanistan (6%), Bangladesh (6%), Iraq (5%), Kuwait (3%), Syria (3%) and Egypt (3%). Three-in-ten Muslim immigrants have arrived in the U.S. since 2010. An additional 26% arrived between 2000 and 2009, and roughly one-in-five (19%) Muslim immigrants arrived in the 1990s. One-in-ten immigrated in the 1980s, 6% arrived in the 1970s and just 2% of Muslim immigrants say they arrived in the U.S. before 1970. The survey also finds that the vast majority of Muslims living in the U.S. (82%) are American citizens, including 42% who were born in the U.S. and 40% who were born abroad but who have naturalized. The remainder are not U.S. citizens (18%). Looked at another way, 69% of all foreign-born U.S. Muslim adults have become naturalized U.S. citizens. No racial or ethnic group makes up a majority of Muslim American adults. A plurality (41%) are white, a category that includes those who describe their race as Arab, Middle Eastern, Persian/Iranian or in a variety of other ways (see sidebar on white racial classifications). About three-in-ten are Asian (28%), including those from South Asia, and one-fifth are black (20%).9 Fewer are Hispanic (8%), and an additional 3% identify with another race or with multiple races. Muslim immigrants are much more likely than U.S.-born Muslims to describe their race as Asian (41% vs. 10%). And U.S.-born Muslims are more likely than immigrant Muslims to be black (32% vs. 11%). In fact, fully half of Muslims whose families have been in the U.S. for at least three generations are black (51%). At present, however, Pew Research Center generally uses the census classifications because they allow comparisons with the general public both for statistical analysis and, in some cases, for weighting of survey data to achieve nationally representative samples. (For more detail on weighting procedures, see the Methodology.) In this survey, nearly nine-in-ten immigrants from the Middle East-North Africa region (87%) are counted as white, including those who volunteered their race as “Arab” or “Middle Eastern,” those who identified with a specific country instead of a race, and those who explicitly identified themselves as white. In total, U.S. Muslim respondents were more likely to be counted as white (41%) than any other listed race option. American-born black Muslims stand out from other U.S. Muslims in several ways, according to the survey: Fully two-thirds are converts to Islam, compared with just one-in-seven among all other U.S. Muslims. And while they are about as likely as other Muslims to say they are proud to be American, U.S.-born black Muslims are less likely than other U.S.-born Muslims to say they have a lot in common with most Americans, and they are more likely than all other U.S. Muslims to say natural conflict exists between the teachings of Islam and democracy. In addition, American-born black Muslims are more likely than other U.S. Muslims to say it has become harder in recent years to be Muslim in the United States. Nearly all American-born black Muslims (96%) say there is a lot of discrimination against Muslims in America, almost identical to the share who say there is a lot of discrimination against black people in the U.S. (94%). African American Muslims have long played a notable role in U.S. Muslim society. However, as immigrant populations from Muslim-majority countries in the Middle East and Asia have grown, African American Muslims have decreased as a share of the U.S. Muslim population.16 The new survey finds that American-born black people account for about 13% of the adult Muslim community.17 And among Muslims whose families have been in the U.S. for at least three generations, fully half are black. Another 6% of all adult Muslims identify as black, but were born outside the U.S., generally in sub-Saharan Africa. Perhaps the best-known group of black Muslims in the U.S. is the Nation of Islam, which at one point counted Malcolm X and Muhammad Ali as high-profile members. But in the Pew Research Center survey, just 3% of all U.S.-born black Muslims say they identify with the Nation of Islam. The vast majority of U.S.-born black Muslims say they are either Sunni Muslims (45%), or they identify with no particular Islamic denomination or they did not answer the question (43%). The American Muslim adult population is considerably younger than the overall U.S. adult population. 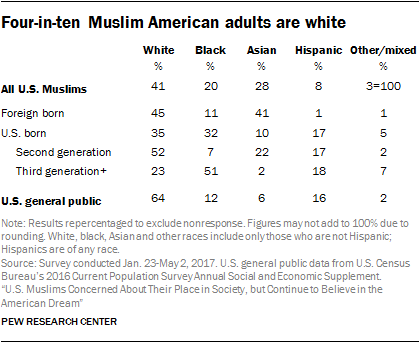 About a third (35%) of Muslim American adults are between 18 and 29 years old, which is a far higher percentage than the share of the general population that falls in that age bracket (21%). Similarly, adults ages 18 to 39 make up 60% of the Muslim American adult population, compared with 38% of the U.S. adult population as a whole. Meanwhile, at the other end of the age spectrum, adults ages 55 and over make up just 14% of Muslim Americans, while people in this older age bracket comprise 36% of the overall U.S. adult population. Another way to compare how old or young a group is within a broader population is to calculate its median age, which for Muslim adults in the U.S. is 35. In the U.S. population as a whole, the median age of adults is 47. Roughly half (53%) of Muslim adults in the U.S. are married. A third (33%) have never been married, while 8% are divorced or separated, 4% are unmarried but living with a partner, and 1% are widowed. Foreign-born Muslims are much more likely to be married than are Muslims who were born in the U.S. (70% vs. 29%). The vast majority of U.S. Muslims who are married have a spouse who is also Muslim. For details, see here. 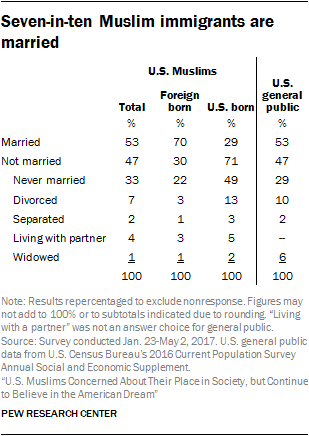 The share of Muslim American adults who are married is identical to the share of U.S. adults overall who are married (53%), even though Muslims are younger than the U.S. general public. The survey results indicate that among adults ages 40 to 59, Muslim Americans report having an average of 2.4 children over the course of their lives. 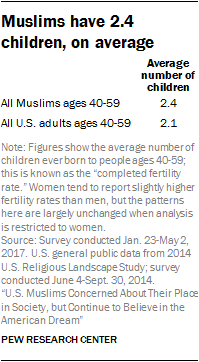 Americans overall average 2.1 children.18 This is in line with previous Pew Research Center research suggesting that, worldwide, Muslims have higher fertility rates than any other major religious group. About three-in-ten U.S. Muslims (31%) have college or postgraduate degrees, equivalent to the share among U.S. adults as a whole (31%). Foreign-born Muslims are more likely to have at least a college degree (38%) than are Muslims born in the U.S. (21%), perhaps reflecting immigration policies that give preference to highly educated immigrants. 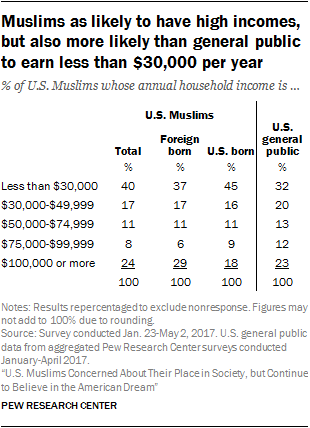 Similarly, U.S. Muslims are about as likely as Americans overall to report household incomes of $100,000 or higher (24% of Muslims and 23% of Americans in general). But they also are more likely to be at the other end of the income scale: 40% of Muslim Americans report household incomes under $30,000, compared with 32% of the U.S. population as a whole. Muslims are also less likely than the general public to fall into the middle range, between $30,000 and $99,999 – 35% of Muslims report household income in this range, compared with 45% of all Americans. The share of Muslims who report owning a home (37%) is considerably lower than among all U.S. adults (57%). Fewer than half of Muslim adults say they are employed full time (44%). Overall, 29% of Muslims are underemployed, in that they are either employed part time but would prefer full-time work (10%), or they are not employed but they are looking for work (18%). By comparison, 12% of U.S. adults overall are underemployed in these ways, according to a 2016 Pew Research Center survey. Still, Muslims are about as satisfied with their finances as are U.S. adults as whole. Asked to rate their personal financial situation, 43% of Muslims say they are in either “good” or “excellent” financial shape, while 56% say they are in “only fair” or “poor” shape financially. Among the general public, 46% rate their financial situation as good or excellent, while 53% say it is only fair or poor. The most common living situation among Muslim Americans – especially immigrants – is a multi-person household in which everyone is Muslim. More than half of Muslims (57%) live this way. An additional 18% of Muslims live in a home with non-Muslims (such as a non-Muslim spouse), while 23% live alone. Half of Muslim Americans live in a household with minor children, and usually those children are Muslim. But 6% of all U.S. Muslims live in households with children who are not Muslim. How many Muslims are there in the United States? And how do we know? There are no U.S. government statistics on the number of Muslim Americans. For that matter, there are no official figures on the size of any religious group in the U.S., because the Census Bureau does not collect information on the religious identification of residents. With surveys like this one, however, demographers can calculate a rough estimate of the number of Muslims who currently reside in the country. Moreover, the U.S. Muslim population has been growing rapidly, albeit from a relatively low base. When the Center first conducted a study of U.S. Muslims in 2007, researchers estimated that there were 2.35 million Muslims of all ages (including 1.5 million adults). By 2011, the number of Muslims had grown to 2.75 million (including 1.8 million adults). 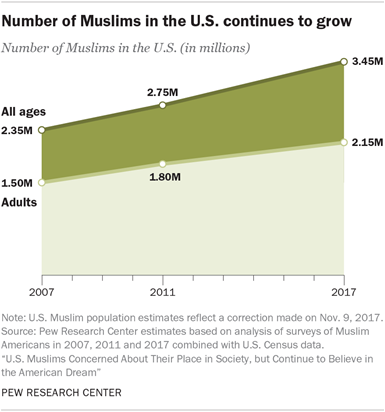 Since then, the Muslim population has continued to grow at a rate of roughly 100,000 people per year, driven both by natural increases due to fertility and by migration of Muslims to the U.S. These estimates are derived through a multistep process that combines information from the survey on the prevalence of Muslims among immigrants and other demographic groups with official Census Bureau statistics on the total number of people in the U.S. who fall into these groups. In the first step of this process, every country in the world is sorted into one of five categories (very high, high, medium, low or very low) based on the percentage of U.S. immigrants from that country who identify as Muslim. 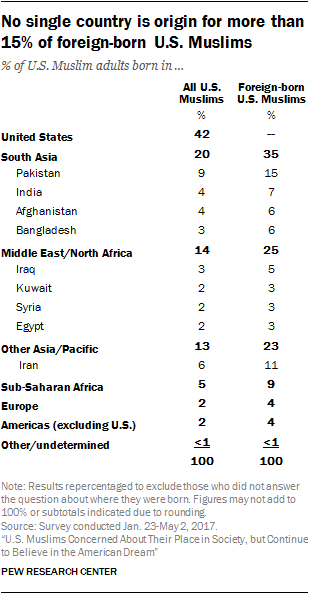 For instance, a large majority of the survey respondents who were born in Pakistan say they are Muslims, and therefore Pakistan is included in the “very high” category; the survey indicates that, on average, about two-thirds of U.S. adults from the “very high” countries are Muslim. The “high” category includes countries such as Afghanistan, Egypt and Jordan, among others; altogether, roughly one-third of respondents born in these countries are Muslim. At the other end of the spectrum, none of the survey respondents who were born in Mexico say they are Muslim, and thus Mexico is included among countries in the “very low” category; the survey indicates that, on average, just one-half of one percent (0.5%) of U.S. residents who were born in the “very low” countries are Muslim. In the third step of the process, this procedure was repeated for immigrants from countries in each of the other categories (high, medium, low, very low), as well as for households in which either the head or spouse is a U.S.-born adult with at least one foreign-born parent. After obtaining estimates of the number of Muslims in each subgroup of the population – including immigrants categorized by country of origin and the U.S.-born categorized by age and race – the figures were summed to generate an estimate of the overall size of the Muslim population. This detailed approach to estimating the size of the Muslim population has several advantages. Perhaps most importantly, research shows that it is easier to reach and survey U.S.-born adults than it is to reach and survey immigrants, especially immigrants who may face a language barrier. Using official statistics from the Census Bureau in the way described above helps ensure that Muslims are not undercounted simply because they were born in countries like Bangladesh or Somalia (for example) and may, therefore, be difficult to reach. The estimate that there are now 3.45 million Muslims in the United States is also consistent with demographic projections outlined in Pew Research Center’s report “The Future of World Religions: Population Growth Projections, 2010-2050.” In that report, demographers compiled data from nearly every country in the world on the current size of religious groups, the age structure and fertility rates of those groups, their rates of religious switching and migration, and related information to produce country-by-country projections of the future growth trajectories of religious groups from 2010 to the year 2050. Those analyses projected that the number of U.S. Muslims (of all ages) would reach 3.3 million by 2015 and 3.85 million by 2020.